Originally constructed during the early twentieth century, 105 Grove Street was for many years home to the family-owned George Rutledge Etched Brass Works company. The firm manufactured brass-etched business signs, commercial tags, and dedication plaques, as well as artistic creations such as desk sets and etched portraits. Born in England in 1844, Rutledge settled at 138 Walnut Street, Montclair, in 1886. At first, Rutledge and his partner located their metal sign etching company in Manhattan; however, the desire to work near home prompted Rutledge to purchase a factory located on Grove Street on May 6, 1903, from an Ella Booth. With Rutledge as the principal etcher and designer/purchaser of all the equipment, the business flourished, requiring expansion of the building in both 1908 and 1910. Unfortunately, also in 1910, Rutledge became ill with Parkinson’s disease. To help with the business, he brought in his nephew Henry George Nash. Nash worked with Rutledge, and then took over the company when his uncle became incapacitated in 1915. Rutledge died in 1921. With him, sadly, went much of the artistic side of the brass works operations. No other family member could match his level of etching artistry. BrassWorks on Grove owns the last etching, a portrait of a master sailing ship, created by Rutledge. By 1931, big changes were afoot at 105 Grove Street – the original building was knocked down to make way for a new space. A one-story, block office and warehouse/garage, this became the first leg of the L-shaped structure that exists today, and is the space that presently houses the BrassWorks on Grove office complex. From 1934 until approximately 1951, in addition to Rutledge Etched Brass Works, the new building was used as a 35-car capacity garage, a machine shop, and tool and die works. Nash ran the company until 1951, when he went into semi-retirement, working only for a select group of 25 clients to keep busy. He transferred ownership to his children, Kenneth and Marianne Nash, who operated the company at the original site until 1956, when they sold the building to Wilmer Realty Corp. After that, they continued to run the family business from a Valley Road location through the 1960’s. Over the years of its existence, the George Rutledge Etched Brass Works company produced many metal-etched commercial signs, building dedications, and framed brass plaques, including some that hang on Mountainside Hospital’s dedication wall today. The company also worked in aluminum and copper, particularly when brass became very expensive during World War I. They produced commercial tags for electric engines, battery box cases and, during World War II, US military ammunition cases. Brass signs, desk sets, and etched portraits can still be found for sale at auctions. From 1956 until 1968, a car dealer used the building for vehicle storage. Subsequent usage of the site included warehousing and shipping of hair products, brake lining refurbishment, auto parts distribution, telecommunication sales, battery ignition service, and office space. In 1969, the site was purchased by Mr. Roy Cook, owner of Rex Hide Automotive, to house his wholesale auto parts business. In 1972, the second part of the L-shaped space was constructed. The warehouse that presently houses E&L Battery and Ignition, is owned by Steven Blumenkranz, a Newark businessman. Blumenkranz’ Grandfather, Eddie, started the business in 1923. In 2006, a partnership consisting of Montclair businessmen and residents Jack Finn, John Reimnitz, and Bob Silver purchased 105 Grove Street from Cook, with the intention of creating a unique professional space. Upon learning the site’s heritage as home to a family-owned brass works company, the partners decided to transform the building while honoring its past, by naming it BrassWorks on Grove. Designed by John Reimnitz Architect, PC and built by Jack Finn & Company Building Contractors, LLC, the present building combines modern amenities with faithful restoration of the original 1930 architectural details. The building received Montclair zoning approval in September 2006, with construction beginning in October 2006, and tenant occupancy occurring in June 2007. A Grand Opening of BrassWorks on Grove was celebrated in September 2007. I would love to take space in one of Bob Silver’s buildings! Please call me at 201-259-6272. Very interesting…I have an engraved etching ” Copyright 1902 by George Rutledge. It is mounted on a wood frame, title “East or West Hame is Best”. Is this of any value….Thank you. We would be interested in it for our collection of engravings….. How large is it…and are you interested in selling? Rutledge works. From my research; which is incomplete and inconclusive, I deduct it is pre 1886 because it notes the address as 302 Broadway NY. It is for an insurance company “established 1837 Citizens Insurance of Missouri”. I am lead to believe a J.B.M. Kehlor of St. Louis ordered this sign for an office or insured building (1881?). It measures 24″X9″ and is non magnetic 1/16″ metal Black with Gold lettering. I would like to find a Bulua number for it if possible. 27 1/8″ X 12 1/8″ frame. On the other side of the sign is a painting which shows 1800’s fishing vessels on a mild stormy day coming to beach or pulling nets. I’m trying to find out if the painting came with the sign or did someone ad it at a later date. What year did Mr. Rutledge open in New York? Hi! I have the same etching as the gentlemen wrote about earlier marked “Copyright 1902 by George Rutledge” …”East or West…Hame is Best”. ….were you able to find anymore info about it? If you were unable to buy it from him, I would be happy to talk with you about mine. Hi. I live in Canada and do disaster clean up pre demolition. I have a george rutledge ” FIREMAN’S FUND INSURANCE COMPANY” sign. Does this sign have any historical value or value if any? The address on the back of the sign is 302 Broadway NY. Send me photo of sign. We have a collection of his signs in our lobby as his company used to be located her. We may be interested in purchasing. where should i send the photo? email? Great to read about the history, thanks . Hello, I have two brass engravings with frames. Both are quotes from Burns poems. One has 1902 George Rutledge on the bottom. The other does not appear to have this marking but looks the same. Both have been in our family for a long time as a pair. I would like to know if there is any interest in them. I have a framed engraving of the jolly beggars, Brass etched in a wooden frame. Has the Rutledge decal on the back. I am interested in selling if anyone is interested. It does need cleaning. I’m willing to send measurements and pics. Nice find. About what year? What condition? About what are you asking ? My father has a brass plate etched by George Rutledge titled “Fox Hunt”. My question is do you know if there is a catalogue of Mr Rutledge’ s works? 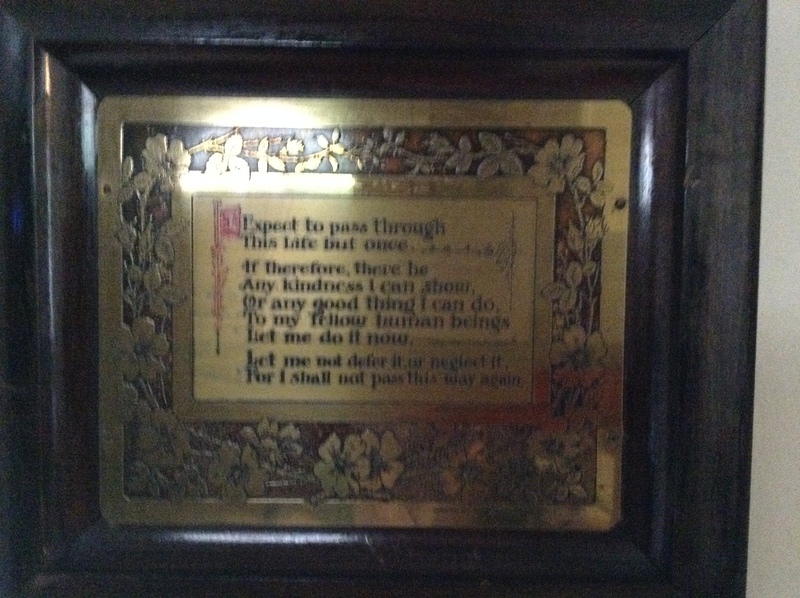 We have many of his brass plate etchings but not that one. If you are ever interested in selling let me know. I have a 1902 George Rutledge “East or West Hame is Best” Original Framed brass etching in very good condition. I have listed it on eBay. I have a brass etching of the Hartford Insurance company with the deer on it. I made a nice frame with a shelf with it. I was wondering if it is of any value. I have a reverse painting in an old frame. The painting says “Established 1806 the Eagle Fire Company of New York the Oldest New York Insurance Company” (all in capital letters) all of the writing is in gold or bronze? There is an eagle in between Eagle and Fire Company. 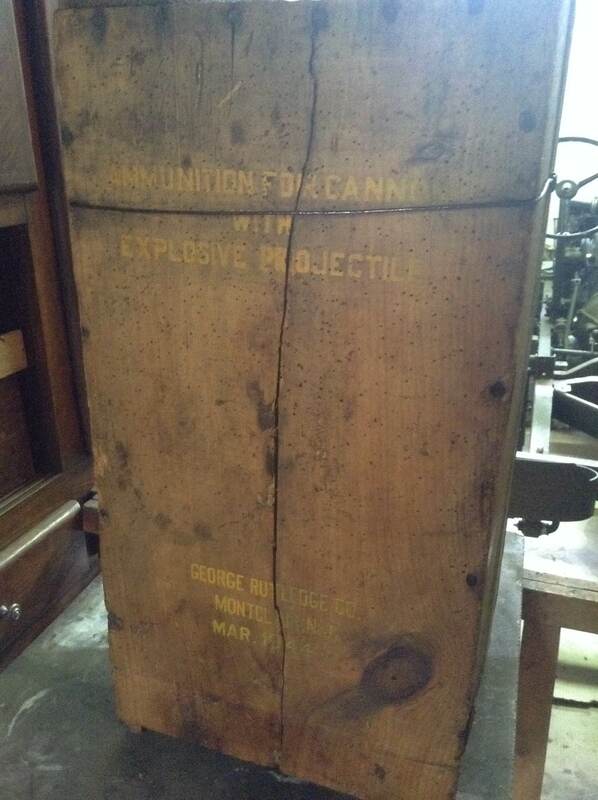 On the back it states GEORGE RUTLEDGE CO SIGNS and DISPLAYS MONTCLAIR, N.J. MADE IN U.S.A. There is a some paint that is flaking off. The back has some water stains. I do not know if this is a fake but it looks old and I can’t find one exactly like it. I found one on an auction sight but it says INCORPORATED 1806. I have a friend that works at an auction house that I was going to send this to but I thought I would send it to you first.